Hendrik Antoon Lorentz (July 18, 1853, Arnhem – February 4, 1928, Haarlem) was a Dutch physicist who ushered in the era of relativity by developing the ideas behind what became known as the Lorentz-FitzGerald contraction. His theories on the electron earned him a Nobel Prize in Physics that he shared with Pieter Zeeman in 1902. 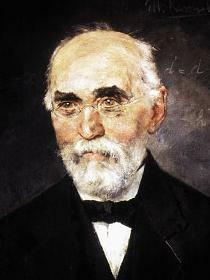 Hendrik Lorentz was born in Arnhem, Gelderland, son of Gerrit Frederik Lorentz (1822 – 1893), a shopkeeper, and Geertruida van Ginkel (1826 – 1861). When Lorentz was four, his mother died, and his father married Luberta Hupkes. From 1866-1869 Lorentz attended high school in Arnhem, and in 1870 entered the University of Leiden, where he was strongly influenced by the teaching of astronomy professor Frederik Kaiser. It was Kaiser who influenced Lorentz to choose physics as a career. Lorentz was awarded a bachelor's degree in mathematics and physics in 1871, and the following year returned to Arnhem to teach high school night classes in mathematics, while continuing to read for his doctorate. In 1875, Lorentz earned a doctoral degree under Pieter Rijke on a thesis entitled On the theory of reflection and refraction of light, in which he refined the electromagnetic theory of James Clerk Maxwell to account for a wide range of optical phenomena. In 1881, Hendrik married Aletta Catharina Kaiser, niece of Frederik Kaiser. She was the daughter of Johann Wilhelm Kaiser, director of the Amsterdam's Engraving School and professor of Fine Arts, and designer of the first Dutch postage stamps in 1852. Later Kaiser was the Director of the Rijksmuseum National Gallery of Amsterdam. Lorentz and his wife had three children, of whom the eldest daughter, Geertruida de Haas-Lorentz followed in her father's footsteps and became a physicist. In 1878, the 24-year-old Lorentz was appointed to the newly established chair in theoretical physics at the University of Leiden. On January 25, 1878, he delivered his inaugural lecture on "De moleculaire theoriën in de natuurkunde" (The molecular theories in physics). During his first 20 years in Leiden, Lorentz was primarily interested in investigating the interrelationship of electricity, magnetism, and light. He also wrote on mechanics, thermodynamics, hydrodynamics, kinetic theories, solid state theory, light, and propagation. His most important contributions, however, were in the area of electromagnetism, the theory of the electron, and relativity. In the 1880s, American scientists Albert Michelson and Edward Morley designed and conducted an experiment that failed to detect any motion of the Earth with respect to the ether, the hypothetical medium that was thought to be responsible for the propagation of light. In 1892, in an attempt to explain the Michelson-Morley experiment while retaining the idea of the ether, Lorentz proposed that moving bodies contract in the direction of motion. George FitzGerald had already arrived at this conclusion using basically the same reasoning. Unlike FitzGerald, however, whose work on the theory was not much more than a brief letter to the journal Science, Lorentz developed the theory and supporting mathematics. He introduced the term local time which varies in reference frames with different uniform velocities relative to one another. Lorentz found that he could not keep the form of Maxwell's equations in different reference frames without assigning each reference frame its own time. Henri Poincaré developed this idea further, and showed how it arose when clocks in moving frames are synchronized by exchanging light signals which are assumed to travel with the same speed against and with the motion of the frame. In 1899 and again in 1904, Lorentz added time dilation to his transformations and published what Poincaré in 1905 named the Lorentz transformations. It was apparently unknown to Lorentz that Joseph Larmor had predicted time dilation, at least for orbiting electrons, and published the identical transformations in 1897. The equations developed by Larmor and Lorentz are algebraically equivalent to those presented by Henri Poincaré and Albert Einstein in 1905 (Macrossan, 1986). These mathematical formulas contained all the important elements of what later became known as theory of Special relativity, namely the relativistic increase of mass, shortening of length, and time dilation that are characteristic of a moving body, all of which Lorentz had discussed in his 1899 publication. 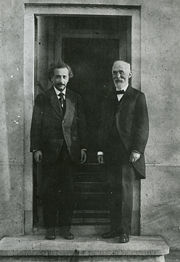 Albert Einstein and Hendrik Antoon Lorentz, photographed by Ehrenfest in front of his home in Leiden in 1921. Source: Museum Boerhaave, Leiden. Mass increase was the first prediction of special relativity to be tested, but from early experiments by Kaufmann it appeared that his prediction was wrong; this led Lorentz to the famous remark that he was "at the end of his Latin." Its confirmation had to wait until 1908. Related to his attempts to understand the Michelson Morley experiment, Lorentz in 1892 devised a theory of the structure of matter that gave it a strong electromagnetic component. His theory of the atom was that it was composed of two oppositely charged components, one of which was larger than the other and constituted most of the atom's mass. In Lorentz's theory, oscillating charges in the atoms (that he called "ions" but were later named "electrons") were responsible for the interaction between light and matter. This theory gave an explanation for the foreshortening necessitated by the Michelson Morley experiment, in terms of electromagnetic properties. Pieter Zeeman, a friend, colleague, and former student of Lorentz, became interested in conducting experiments to determine the relationship between light and magnetism in the mid-1890s. Encouraged by the results of Michael Faraday over half a century earlier, Zeeman hoped to determine the effect of a magnetic field on the spectral lines of sodium. His supervisor failed to share his enthusiasm, but Lorentz encouraged Zeeman. Zeeman was able to perform the experiment, burning a sample of a sodium compound between two strong electromagnets and analyzing the resulting spectrum. He detected a change—a splitting of the spectral lines. Lorentz immediately used the results to make one of the first measurements of the ratio of the charge to the mass of an electron, based on his theory of matter. He could also establish that the electron carried a negative electric charge. A year later, J.J. Thompson used an entirely different but more direct method to measure the same quantity, the results of which closely approximated Lorentz's. Lorentz and Zeeman, mentor and student, were both awarded the Nobel Prize in 1902—Zeeman for his experiments that led to the discovery of the effect that bears his name, and Lorentz for his theory of the electron. In 1906, Lorentz traveled to America and delivered a series of lectures on relativistic electromagnetic theory. These lectures were published in 1909 under the title Theory of Electrons. In 1912, Lorentz retired early to become director of research at Teylers Museum in Haarlem, although he remained external professor at Leiden and gave weekly lectures there. Paul Ehrenfest succeeded him in his chair at the University of Leiden, founding the Institute for Theoretical Physics, which would become known as the Lorentz Institute. In addition to the Nobel Prize in Physics, Lorentz received a great many honors for his outstanding work. He was elected a Fellow of the Royal Society in 1905. The Society awarded him its Rumford Medal in 1908 for his investigations of optical and electrical phenomena, and its Copley Medal for his research in mathematical physics in 1918. While Lorentz is mostly known for fundamental theoretical work, he also had an interest in practical applications. In the years 1918-1926, at the request of the Dutch government, Lorentz headed a committee to calculate some of the effects of the proposed Afsluitdijk (Closure Dike) flood control dam on other seaworks in the Netherlands. Hydraulic engineering was mainly an empirical science at that time, but the disturbance of the tidal flow caused by the Afsluitdijk was so unprecedented that the empirical rules could not be trusted. Lorentz proposed to start from the basic hydrodynamic equations of motion and solve the problem numerically. The Afsluitdijk was completed in 1933 and the predictions of Lorentz and his committee turned out to be remarkably accurate. In his last years, Lorentz aligned himself with Einstein and his attempt to explain gravity using a line of reasoning that, in a sense, was an extension of Lorentz's. Einstein had given proper credit to Lorentz's ideas, while Lorentz admitted that Poincaré had put the final touches on his own. Lorentz wrote essays for the general public in an attempt to demystify Einstein's general theory of relativity, which had experienced some experimental triumphs in the last decade of Lorentz's life. Lorentz died in Haarlem, the Netherlands, on February 4, 1928. Lorentz had the foresight to extend Maxwell's work by establishing a theory of matter that led to the discovery of the electron and to the extension of Maxwell's equations to reference frames moving uniformly with respect to one another. Lorentz's work, and that of many of his contemporaries, such as Henri Poincare and Larmor, show that theories of relativity were not confined to those of Einstein, although Einstein took much of the wind out of others' sails by extending his theory to include gravitation. It was Lorentz who took the world into a new realm of time and space contraction and variable mass, and led to speculation in popular culture about time travel, potential slowing of the aging process, and other marvelous concepts about time and space. 1899, Simplified Theory of Electrical and Optical Phenomena in Moving Systems. Retrieved August 19, 2007. 1900, Considerations on Gravitation. Retrieved August 19, 2007. 1904, Electromagnetic phenomena in a system moving with any velocity smaller than that of light. Retrieved August 19, 2007. 1917, On Einstein's Theory of gravitation. Retrieved August 19, 2007. 1909/1916: The theory of electrons. (Lorentz's magnum opus.) Retrieved August 19, 2007. 1920, The Einstein Theory of Relativity. Retrieved August 19, 2007. 1931, Lectures on Theoretical Physics (vol. I-III). Retrieved August 19, 2007. ↑ Lorentz, Poincaré Retrieved August 25, 2007. ↑ Marco Mamone Capria. 2005. Physics before and after Einstein. (Amsterdam: IOS Press. ISBN 1586034626), 34-36. ↑ Albert E. Moyer, 1983. "American physics in transition: a history of conceptual change in the late nineteenth century." The History of Modern Physics, 1800-1950, Vol. 3. (Los Angeles: Tomash Publishers. ISBN 0938228064), 151. De Haas-Lorentz, Geertruida Luberta. 1957. H.A. Lorentz: Impressions of His Life and Work. Amsterdam: North-Holland Pub. Co. OCLC 11866855.
van Delft, Dirk. February 2004. The case of the stolen rooms. European Review 12(1): 95-109. Brown, Harvey R. October 2001. The origins of length contraction: I. The FitzGerald–Lorentz deformation hypothesis. American Journal of Physics 69(10): 1044-1054. Kox, A.J. May 1997. The discovery of the electron: II. The Zeeman effect. Eur. J. Phys 18(3): 139-144. Kox, A.J. March 1996. H.A. Lorentz: Sketches of his work on slow viscous flow and some other areas in fluid mechanics and the background against which it arose. Journal of Engineering Mathematics 30(1-2): ii, 1-18. Kox, A.J. March 1993. Einstein, Lorentz, Leiden and general relativity. Classical and Quantum Gravity 10: S187-S191. Kox, A.J. November 1990. H. A. Lorentz's contributions to kinetic gas theory. Annals of Science 47(6): 591-606. Kox, A.J. March 1988. H.A. Lorentz: Hendrik Antoon Lorentz, the ether, and the general theory of relativity. Archive for History of Exact Sciences 38(1): 67-78. Klein, M. J. 1967. Letters of wave mechanics: Schrödinger, Planck, Einstein, Lorentz, Edited by K. Przibram. New York: Philosophical Library. Larmor, J. 1897. On a dynamical theory of the electric and luminiferous medium. Phil. Trans. Roy. Soc. 190: 205-300. (Third and last in a series of papers with the same name). Macrossan, M. N. 1986. A note on relativity before Einstein. Brit. J. Phil. Sci. 37: 232-234. Retrieved August 19, 2007. Poincaré, H. 1900. La théorie de Lorentz et le Principe de Réaction. Archives Neerlandaises V: 253-78. Poincaré, H. 1902. La Science et L'Hypothèse. Quote from the English translation Science and Hypothesis, Walter Scott (1905) as republished unabridged by Dover 1952, 175. Poincaré, H. 1905. Sur la dynamique de l'électron. Comptes Rendues 140:1504-8. Poincaré, H. 1913. Dernières Pensées Ernest Flammarion 1913. Quote from English translation: Mathematics and Science: Last Essays. New York: Dover. 1963. Hendrik A. Lorentz - Biography at Nobelprize.org. Lorentz Lab at the Teylers museum. H.A.M. Snelders, Lorentz, Hendrik Antoon (1853-1928), in Biografisch Woordenboek van Nederland. Lorentz and the Zuiderzee project. A.J. Kox Ph.D. students of H.A. Lorentz: 1881-1921. This page was last modified on 14 December 2017, at 16:00.